Microtia repair provides many challenges to the facial plastic surgeon. It requires the maintenance of the 3-dimensional details of an ear under the coverage of a 2-dimensional skin surface. In addition, an aesthetically pleasing result requires symmetric position, adequate projection, and dependable longevity. All of these factors contribute to microtia repair being one of the most demanding yet rewarding procedures to perform. The reconstructed auricle has an immeasurable positive psychological and emotional impact on the self-esteem of a young child with microtia. This article reviews the history and pertinent evaluation of microtia repair, and it includes a detailed description of the surgical techniques currently considered the criterion standard. The image below depicts microtia. Microtia repair was first reported by Sushruta in 600 BC. He noted that the surgeon should "slice off a patch of living flesh from the cheek of a person devoid of ear lobes in a manner so as to have one of its ends attached to its former seat.”  In 30 AD, Celsus recommended advancement flaps, and, in 1575, Pate used an ear prosthesis made of enameled metal. Grade 1 microtia is characterized by an abnormal auricle with all identifiable landmarks. Grade 2 microtia consists of an abnormal auricle without some identifiable landmarks. Grade 4 microtia is anotia. 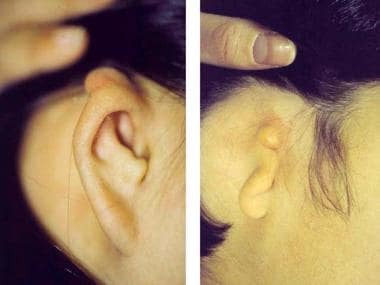 Grade I microtia is characterized by a mild deformity with a slightly dysmorphic helix and antihelix, as depicted in the 1st image below. All the major structures are present, and no additional cartilage is necessary during surgical repair. Characteristic lop ear and cup ear abnormalities are categorized into this group. Also, a Stahl ear has features of a third crus with a flattened scaphoid fossa and deficient antihelix, as depicted in the second image below. Stahl ear deformity with third crus. Grade II microtic ear deformities have all major structures present to some degree, but repair requires cartilage or skin, as depicted in the image below. The external auditory meatus is present but with stenosis. Typical defects include severe cup ears, as depicted in the 1st image below. A: Grade II microtia. B: Grade III microtia. The grade III abnormality is characterized by few, if any, landmarks. If present, the lobule is usually positioned anteriorly. Peanut and anotic ears are examples of grade III malformations, as depicted in the second image above. Type A microtia consists of an anotic ear. Type B microtia describes a completely hypoplastic ear with or without aural atresia. Type C microtia consists of hypoplasia of the middle third of the auricle. Type D microtia is characterized by hypoplasia of the superior third of the auricle. A prominent ear is classified as type E microtia. Grade I microtia is any normal ear that is reduced in size. Grade II microtia is an ear with structural deficiencies. Grade III microtia is characterized by the classic peanut deformity and includes the anotic ear. The incidence of microtia is 1 per 5,000-20,000 births. The incidence of microtia is 1 per 900-1200 births in the Navajo population and 1 per 4000 births in the Japanese population. The male-to-female ratio is 2.5:1. Microtia is typically unilateral rather than bilateral (unilateral-to-bilateral ratio of 4:1). The right ear is affected more frequently than the left ear (right-to-left ratio of 3:2). The reason for this predilection remains unclear. Although no specific chromosomal abnormality for microtia has been cited, a multifactorial inheritance is considered. An immediate family history is noted in approximately 5% of patients. Prenatal infections and teratogens such as isotretinoin, thalidomide, and maternal rubella have been implicated. Fifty percent of microtia cases are associated with congenital syndromes. Hemifacial microsomia is a spectrum of craniofacial malformations characterized by asymmetric facies with microtia, malar or mandibular hypoplasia, cleft palate, tragal skin tags, upper eyelid colobomas, and facial nerve paralysis, as depicted in the image below. Goldenhar syndrome is a nonhereditary variant of hemifacial microsomia associated with abnormal development of the first and second branchial arches. Associated findings include preauricular nodes, epibulbar dermoids, malar and mandibular hypoplasia, and vertebral, cardiac, or renal abnormalities. Treacher Collins syndrome (ie, mandibulofacial dysostosis, Franceschetti syndrome) is an autosomal dominant inherited disease isolated to chromosome arm 5q. Typical features in addition to microtia include stenosis or atresia of the external auditory canal, middle ear abnormalities, antimongoloid slanting of the palpebral fissures, lower lid colobomas, partial or near absence of eyelashes, microstomia, hypoplastic zygoma and mandible, and a narrow or cleft palate. 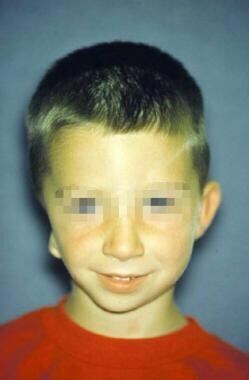 Oculoauricular vertebral dysplasia is characterized by microtia with cervical spine anomalies and epibulbar dermoids. A number of associated abnormalities and syndromes may coexist with microtia and highlight the necessity for a thorough head and neck examination with attention to recognizing these features. In a review of 1200 cases of microtia, associated deformities included branchial arch deformities (36.5%), facial nerve weakness (15.2%), cleft lip and/or palate (4.3%), urogenital defects (4%), cardiovascular malformations (2.5%), and macrostomia (2.5%). The evaluation for microtia repair begins with a head and neck examination that emphasizes facial asymmetry; retrognathia (or other airway concerns common to this group); integrity of the facial nerve; quality of non–hair-bearing skin in the vicinity of the auricle, hairline, position of the remnant auricle, and future lobule; and condition of the contralateral ear. The patient should be referred to an otologist if other middle or inner ear abnormalities exist. Patients who undergo microtia repair are typically in the pediatric age group, but patients may also include adults who have delayed seeking repair. The operative indication is the patient's desire to repair the congenital deformity. Although repair is elective in the sense that an absent auricle is not life threatening, the negative psychosocial impact of a facial malformation may cause irreparable damage to an individual's self-image. Completion of the surgical repair before the patient enters the first grade has concrete advantages during the adolescent years and is usually encouraged. However, surgical repair in younger children is usually limited by the size of their chest walls and donor site cartilage. The goals of repair should be clearly discussed to establish realistic expectations. Microtia repair aims to make the reconstructed ear less conspicuous, but the result is not necessarily an ear that appears normal under close scrutiny. The external ear and middle ear are derived from the first and second branchial arches. 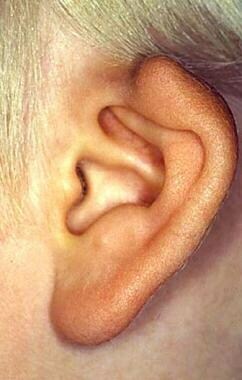 By the fifth week of gestation, the external ear begins to develop as 6 small buds of mesenchyme along these arches. These hillocks, called the auricular hillocks of His, fuse during the 12th week. 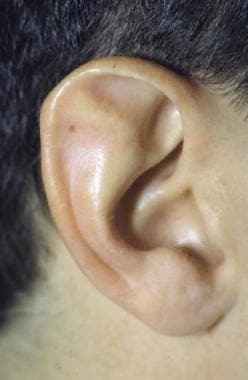 By the 20th week, the adult auricle is formed. 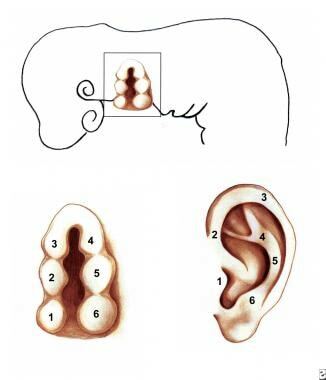 Each hillock of His represents an anatomic structure of the ear, as depicted in the image below. The first 3 hillocks are formed from the first pharyngeal arch. The first hillock forms the tragus, the second hillock develops into the helical crus, and the third hillock eventually becomes the helix. The remaining 3 hillocks are formed from the second pharyngeal arch. The fourth and fifth hillocks become the antihelix, while the sixth hillock forms the antitragus. A: Hillocks of His. B: Derivatives of the hillocks of His. The first 3 hillocks are derived from the first pharyngeal arch. The last 3 hillocks are derived from the second pharyngeal arch. The first hillock forms the tragus; the second forms the helical crus; the third forms the helix; the fourth and fifth form the antihelix; and the sixth forms the antitragus. 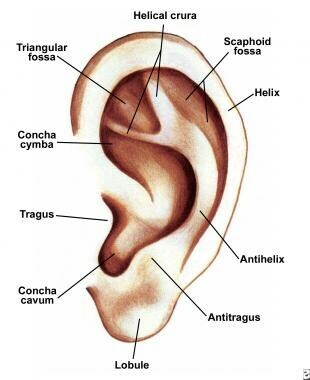 The named landmarks of the normal adult ear include the helix, antihelix, tragus, antitragus, lobule, concha cavum, concha cymba, scaphoid fossa, triangular fossa, and crura of the antihelix, as depicted in the image below. At birth, the height of the ear is 66% of adult size. The ear is approximately 85% of full size by age 6 years and 90% by age 9 years. The height of the average adult ear ranges from 5.5-6.5 cm, achieved at age 15 years in boys and age 13 years in girls. The width is approximately 55% of the height. Because the final adult size is nearly achieved by age 6 years, the contralateral normal ear serves as a reasonable template of the final auricular height. The normal protrusion from the mastoid is 1.5-2 cm or approximately 15-20°. Named landmarks of the normal auricle. The primary blood supply is from the superficial temporal artery and the posterior auricular artery. Sensory innervation is provided by the greater auricular nerve (C3), lesser occipital nerve (C2, C3), auricular branch of cranial nerve (CN) X, auriculotemporal nerve (V3), and sensory twigs of CN VII and IX. A contraindication for microtia repair is a patient who is too young and has inadequate chest wall development. Anxious parents often request surgical intervention at the earliest age possible, but reconstruction is usually delayed until the patient is aged 5-6 years. Moreover, the small degree of emotional maturity that occurs in the following 1-2 years often significantly affects postoperative care. A relative contraindication relates to the expected outcomes of this challenging operation and the degree of initial auricular deformity. Because even the best repairs cannot withstand close inspection by a layperson, one should exercise caution when repairing ears that are only mildly deformed (eg, grade I microtia, grade II microtia). Smaller procedures using common otoplasty techniques with scoring and sutures are often more appropriate in such circumstances. Bly RA, Bhrany AD, Murakami CS, Sie KC. Microtia Reconstruction. Facial Plast Surg Clin North Am. 2016 Nov. 24 (4):577-91. [Medline]. McDowell F. The classic reprint. Ancient ear-lobe and rhinoplastic operations in India. Plast Reconstr Surg. 1969 May. 43(5):515-22. [Medline]. Gillies H. Plastic Surgery of the Face. London: 1920. Gillies H. Reconstruction of the external ear with special reference to the use of maternal ear cartilages as the supporting structure. Rev Chir Structive. 1937. 7:169. Tanzer RC. Reconstructive Plastic Surgery. 2nd ed. Philadelphia: WB Saunders Co; 1977. Brent B. Technical advances in ear reconstruction with autogenous rib cartilage grafts: personal experience with 1200 cases. Plast Reconstr Surg. 1999 Aug. 104(2):319-34; discussion 335-8. [Medline]. Marx H. Dies Missbildungen des Ohres. Denker A, Kahler O, eds. Handbuch der Hals-Nasen und Ohrenheilkunde: Bd VI. 1026: 131-169. Weerda H. Classification of congenital deformities of the auricle. Facial Plast Surg. 1988 Oct. 5(5):385-8. [Medline]. Aguilar EA 3rd, Jahrsdoerfer RA. The surgical repair of congenital microtia and atresia. Otolaryngol Head Neck Surg. 1988 Jun. 98(6):600-6. [Medline]. Fukuda O, Yamada A. Reconstruction of the microtic ear with autogenous cartilage. Clin Plast Surg. 1978 Jul. 5(3):351-66. [Medline]. Bauer BS. Reconstruction of microtia. Plast Reconstr Surg. 2009 Jul. 124(1 Suppl):14e-26e. [Medline]. Thorne CH, Wilkes G. Ear deformities, otoplasty, and ear reconstruction. Plast Reconstr Surg. 2012 Apr. 129(4):701e-16e. [Medline]. Billings KR, Qureshi H, Gouveia C, Ittner C, Hoff SR. Management of hearing loss and the normal ear in cases of unilateral Microtia with aural atresia. Laryngoscope. 2015 Aug 8. [Medline]. Lo JF, Tsang WS, Yu JY, Ho OY, Ku PK, Tong MC. Contemporary hearing rehabilitation options in patients with aural atresia. Biomed Res Int. 2014. 2014:761579. [Medline]. Montino S, Agostinelli A, Trevisi P, Martini A, Ghiselli S. Check-list for the assessment of functional impairment in children with congenital aural atresia. Int J Pediatr Otorhinolaryngol. 2017 Nov. 102:174-9. [Medline]. Williams JD, Romo T 3rd, Sclafani AP, et al. Porous high-density polyethylene implants in auricular reconstruction. Arch Otolaryngol Head Neck Surg. 1997 Jun. 123(6):578-83. [Medline]. Reinisch JF, Lewin S. Ear reconstruction using a porous polyethylene framework and temporoparietal fascia flap. Facial Plast Surg. 2009 Aug. 25(3):181-9. [Medline]. Federspil PA. Auricular Prostheses in Microtia. Facial Plast Surg Clin North Am. 2018 Feb. 26 (1):97-104. [Medline]. Service GJ, Roberson JB Jr. Current concepts in repair of aural atresia. Curr Opin Otolaryngol Head Neck Surg. 2010 Dec. 18(6):536-8. [Medline]. Roberson JB Jr, Reinisch J, Colen TY, Lewin S. Atresia repair before microtia reconstruction: comparison of early with standard surgical timing. Otol Neurotol. 2009 Sep. 30(6):771-6. [Medline]. Li GF, Hu YG, Ding W, et al. Reconstruction of Tragus and External Auditory Meatus using Remnant Auricle during Microtia Reconstruction. Facial Plast Surg. 2018 Apr. 34 (2):227-9. [Medline]. Song Y, Song Y. An improved one-stage total ear reconstruction procedure. Plast Reconstr Surg. 1983 May. 71(5):615-23. [Medline]. Nagata S. Modification of the stages in total reconstruction of the auricle: Part I. Grafting the three-dimensional costal cartilage framework for lobule-type microtia. Plast Reconstr Surg. 1994 Feb. 93(2):221-30; discussion 267-8. [Medline]. Chen ZC, Goh RC, Chen PK, Lo LJ, Wang SY, Nagata S. A new method for the second-stage auricular projection of the Nagata method: ultra-delicate split-thickness skin graft in continuity with full-thickness skin. Plast Reconstr Surg. 2009 Nov. 124(5):1477-85. [Medline]. Kawanabe Y, Nagata S. A new method of costal cartilage harvest for total auricular reconstruction: part I. Avoidance and prevention of intraoperative and postoperative complications and problems. Plast Reconstr Surg. 2006 May. 117(6):2011-8. [Medline]. Kawanabe Y, Nagata S. A new method of costal cartilage harvest for total auricular reconstruction: part II. Evaluation and analysis of the regenerated costal cartilage. Plast Reconstr Surg. 2007 Jan. 119(1):308-15. [Medline]. Brent B. Auricular repair with autogenous rib cartilage grafts: two decades of experience with 600 cases. Plast Reconstr Surg. 1992 Sep. 90(3):355-74; discussion 375-6. [Medline]. Sakamoto T, Kikuta S, Kikkawa YS, et al. Prognostic factors for long-term hearing preservation after canal-tympanoplasty for congenital aural atresia. Eur Arch Otorhinolaryngol. 2015 Nov. 272 (11):3151-6. [Medline]. Peer LA. Reconstruction of the auricle with diced cartilage grafts in a Vitallium ear mold. Plast Reconstr Surg. 3:653. Bichara DA, O'Sullivan NA, Pomerantseva I, Zhao X, Sundback CA, Vacanti JP. The tissue-engineered auricle: past, present, and future. Tissue Eng Part B Rev. 2012 Feb. 18(1):51-61. [Medline]. Eavey RD, Monroy A, Nicolau Y, et al. Microtia repair: the case for surgical reconstruction. J Oral Maxillofac Surg. 2006 Nov. 64(11):1655-63. [Medline]. Gion GG. Surgical versus prosthetic reconstruction of microtia: the case for prosthetic reconstruction. J Oral Maxillofac Surg. 2006 Nov. 64(11):1639-54. [Medline]. Park C, Mun HY. Use of an expanded temporoparietal fascial flap technique for total auricular reconstruction. Plast Reconstr Surg. 2006 Aug. 118(2):374-82. [Medline]. Tai Y, Tanaka S, Fukushima J, et al. Refinements in the elevation of reconstructed auricles in microtia. Plast Reconstr Surg. 2006 Jun. 117(7):2414-23. [Medline]. Instruments used for carving costal cartilage. A: Stage III, skin incision for ear elevation. B: Wedge of cartilage placed as buttress graft for projection support. C: Skin graft in position. A: Stage IV, composite graft for tragal reconstruction. B: Shadow created by tragus. Tissue-engineered cartilage for potential microtia repair. After atresia repair, with new ear canal. The authors and editors of Medscape Reference gratefully acknowledge the contributions of previous author David H Chi, MD, to the development and writing of this article.